With 14 individual products from plain woven fabrics to sober colors, the collection covers lounges, hotel rooms, restaurant terraces, shops and balconies. 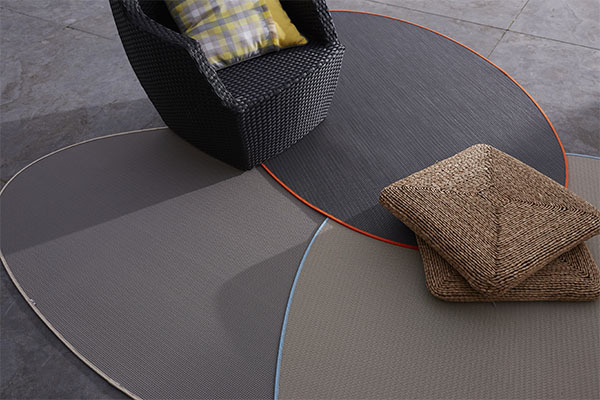 Dickson® rugs bring out the best in your interiors and exteriors and give them a touch of modernity. Take advantage of the multitude of available colors to create your own universe. Tired of conventional designs? It’s time to put your foot down! Choose from thousands of possible color and finish combinations, with natural-finish products, 14 Sunbrella® braids, 17 Sunbrella® acrylic cable cords and 7 Dickson® vinyl cable cords. Dickson designed a lot of colors in order to create a rug at your image. Both refined and discreet, the Sunbrella® braid subtly outlines the rug’s shape, perfectly hugging the curves and contours of the geometric pieces. The Sunbrella® acrylic braid resists outdoor conditions over time without deteriorating. 12 new colours have been added to the existing range of five for a wealth of subtle, refined, natural and luminous colours. Sunbrella® fabrics offer high-end finishings to add comfort and class to any living space, whether indoors or outdoors. Sunbrella® fabrics resist outdoor conditions over time without deteriorating. They are given a special treatment to resist stains and mould. This woven vinyl finishing is particularly well suited for permanent outdoor use or use in a high-traffic corridor, and as such is the best compromise between durability and aesthetics. View images of different color and material combinations on which you can work to create the carpet that suits you.